I saw fresh cornmeal in the store and bought it. There were a lot of recipes with cornmeal waiting to happen. I love the coarse texture a unique taste of fresh cornmeal. I use it in my bakes and love the flavor it imparts. 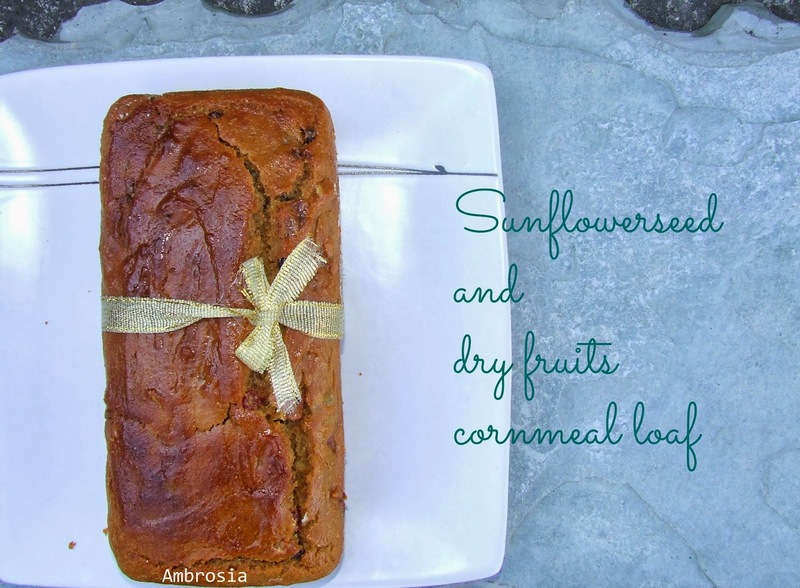 With a lot of dry fruits and sunflower seeds in the stock and fresh cornmeal, I made Sun flower seed and dry fruits cornmeal loaf. 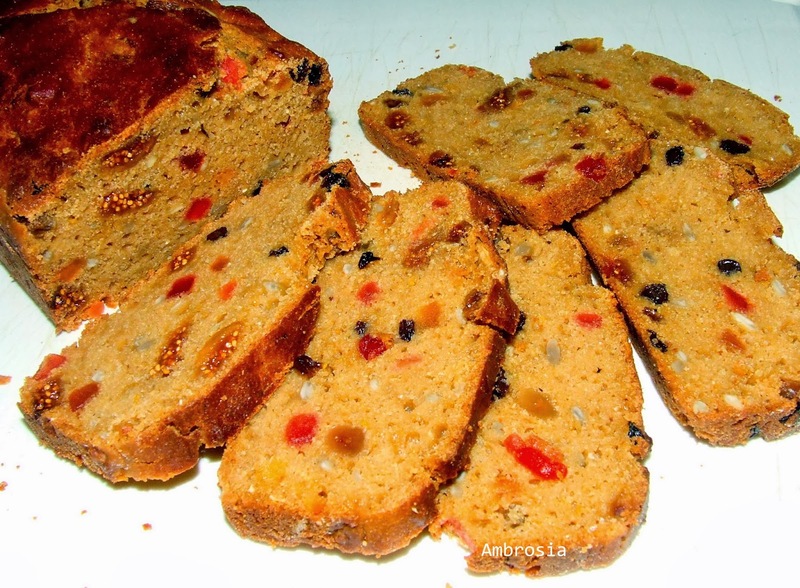 Quick bread that has all the healthy ingredients and is egg less and butter free. Kind of bread that leaves no guilt even if you’ve had an extra slice or two. The flavour of honey is beautiful. It is a great accompaniment to endless glasses of tea that are enjoyed on chilly winter days. Great savior when kids are hungry and a good excuse to have another cuppa. Preheat oven to 180 degrees C. Line, grease and dust two 7 x 3 inch loaf pans. Whisk together all purpose flour, corn meal, baking soda and salt. Combine yogurt, honey, maple syrup, oil and vanilla extract in a large bowl. Mix well. Add flour mix to yogurt mix stirring just until moist. Pour the batter in the prepared pans. Level with a spoon. Bake for 35 to 40 minutes or until a tooth pick inserted in the center comes out clean. Remove from the pans after 10 minutes. Cool on a wire rack. Wow... cant decide if that is a cake or a bread loaf! Looks very nice Namita. Been a while since I baked with cornmeal... this reminds me! You are truly a magician to bake such amazing breads. Admire your quest to use healthy ingredients.